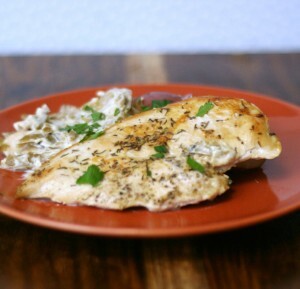 Season the chicken breasts with salt, pepper, and thyme. Cook in the skillet, turning when necessary until chicken is cooked through. Remove chicken from the pan, and add in potatoes, green beans, and mushrooms. In a small bowl, whisk together wine, stock, and sour cream. Pour over the vegetables. Add lemon slices to the skillet, and allow to simmer for 5 minutes. Add chicken back into the skillet and allow to heat through, approximately 5 minutes.